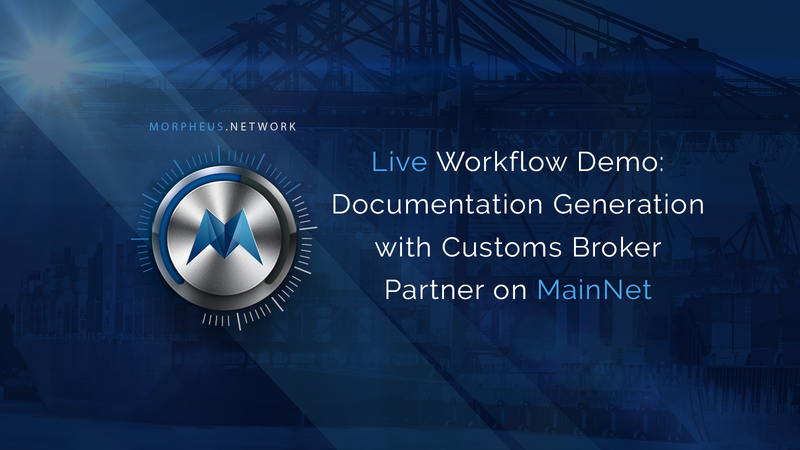 In a pinnacle, ground-breaking moment for Morpheus.Network, CEO Dan Weinberger, in collaboration with Jim Maslowski from Customs Direct, a customs broker and Morpheus.Network partner, host a live demo of a fully automated workflow on the MainNet. This video features a real-world, cross-border shipment being cleared through U.S. Customs and Border Protection (CBP) — in action! We showcase the Integrated Module developed together with Customs Direct for generating, storing, and sharing documents with CPB and automate cross border logistics. This includes digitalization of documentation for the USCMA region and all the process steps for the Digital Footprint. After receiving the documents, Jim in Sioux Falls, South Dakota is able to use Morpheus.Network’s automated workflow for electronic filing, which puts essential information on the distributed ledger including the release documents. This saves time and prevents errors from the manual creation of the bill of lading, commercial invoice, CBP forms 3461 and 7501, a key reason for holding up goods at all USA entry points. No special hardware or software installs are required and the platform utilizes geo-location to track digital document handling. SUPPLY CHAIN EXECUTIVES: Register today to secure your front-row seat on global supply chain optimization. Only 10 highly qualified enthusiasts will be accepted into the next stage of the pioneer program. BUSINESS PARTNERS: Contact us today to verify the benefits of leveraging your contacts and/or seamlessly integrating your value added services for automating global supply chains, with no up-front costs or large investments.